How a mechanical limitation forced “2001: A Space Odyssey” to slow down. The following is an excerpt from Space Odyssey: Stanley Kubrick, Arthur C. Clarke, and the Making of a Masterpiece by Michael Benson. Much has been written about 2001’s stately pace, with its spacecraft waltzing across the screen in dignified, measured orbital cadences and Discovery’s solemn progress to Jupiter unfolding with the unhurried regal tempo of an 18th-century monarchal procession leading inevitably to that Louis XIV hotel suite. It turns out, however, that the film’s internal speedometer was limited by an oddly prosaic factor: the flicker factor of stars when filmed at twenty-four frames per second. Attempts to represent 2001’s starry backgrounds went through several phases, with initial tests involving drilling hundreds of holes into black metal sheeting and positioning lights behind them. This technique was soon judged wanting because as the lens tracked by, the stars either became elliptical due to camera motion, or their brilliance changed, or they twinkled—the latter a big no‑no in the airless environment of space. With drilled starscapes judged inadequate, another method was tried in which dots of paint were speckled across glass, with the glass then angled and lit from below. But glass being two-sided, each star ended up with a reflected double—another no‑no. Finally, a decision was made to film all the stars on the animation stand, and Trumbull was recruited to airbrush random white specks of paint onto black backgrounds. These were then lit from above. While this produced perfect star fields, it’s also when the speed limit of 2001’s filmic universe became apparent. Most of the shots looked best with those stars moving in one direction and velocity, while the foregrounded spacecraft, filmed separately, moved in another, usually contrary direction and speed. Having grasped this, Con Pederson worked to optimize the best stellar drift directions and speeds, and the same for the spacecraft. He determined, for example, that if Discovery was moving from the left to the right of the frame, and the stars were drifting from the top to the bottom, the result was a kind of floating sensation. After much trial and error, a kind of vocabulary of eight optimal drift directions and speed combinations was established. It was at this stage that the realization sank in among 2001’s effects crew that at the standard rate of twenty-four frames per second—which they couldn’t evade, since all film projectors functioned at that speed—fast camera moves were going to be a problem. The issue was that in analog film projectors, each frame actually flickers twice, producing forty-eight flashes of light per twenty-four frames of image. And because of the inherent persistence of human vision, bright white objects such as stars seem to double. At still-faster star motion rates, they triple—an even worse strobing effect. “And so very early in the production, we hit a speed limit that we introduced,” Trumbull recalled. “And that was the law of the movie, to never move faster than that speed so you didn’t ever get double stars.” The stately pulse of 2001’s space sequences, then, was governed by the substrobe rate of their moving star fields. With this having been established, there remained the question of how to combine those slow-moving star fields with 2001’s spacecraft miniatures. Kubrick and Veevers had improvised a screening room technique in which two projectors were used to ascertain which speeds and directions worked best together: one to project the star fields, the other the spacecraft. But with this kind of live mix, stars flowed visibly across Discovery’s exterior. Obviously, this couldn’t be used in the final film, where it would instantly obliterate the audience’s willing suspension of disbelief, and so an animation technique was devised to mask the stars. It required the production of rotoscope mattes, permitting the frame-by-frame removal of background stars wherever the spacecraft was present in the frame. This was all hugely labor intensive, however, and a team of young people was soon brought in to what became known as the “blobbing room.” There they spent innumerable hours meticulously tracing spacecraft outlines onto animation cels (the transparent sheets on which shapes or objects are drawn in analog animation), then blacking them in with paint. Their laborious outlining, and equally monotonous removal of individual stars, took the tedium of traditional handmade animation to a new level. Colin Cantwell used to drop by and check up on the “blobbers,” who, he noticed, had “gotten pretty strange” under the relentless pressure of their star-killing duties. Benson, Michael. 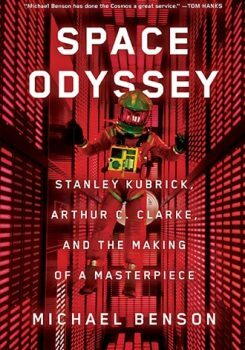 Space Odyssey: Stanley Kubrick, Arthur C. Clarke and the Making of a Masterpiece. Copyright 2018 by Michael Benson. Reprinted with permission.